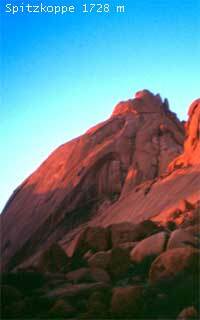 Spitzkoppe is a wonderful red granite monolith of incredibly beauty. It is located in a country with innumerable wonderful things: natural parks, the high dunes of Sussusvlei, the Atlantic's stormy coast, the great organization and strudels coming as heritage from the days of German colonisation. It is a fantastic experience allowing us to climb in a park of rare beauty in relative comfort. The climb of Spitzkoppe's shouldn't be underestimated. Although it isn't difficult (max 5+), it is a bit complicated, with several absailing and it can take from 8 to 10 hours and be a tiring day. Duration: it can vary from one week to 10 days.